We are leading exporter and Manufacturer of Jewelry Box. We have a variety of Jewellery Boxes in different shapes and sizes. Are you finding the perfect necklace organizer which is made of handmade paper? Are you also looking for other jewellery display solution that not only organizes but also protects your jewelry from fear of being lost or scratched? This can be challenge but not anymore. We deliver the unexpected by using recycled materials like handmade paper to create a truly sensational storage and display solution for your most delicate and cherished items. Our factory is producing sturdy handmade paper box that display your jewellery at varying heights, making it ideal for organizing your favourite necklaces, bracelets, bangles, rings, earrings and more. The top of each handmade paper box includes an innovative storage box design for holding studded earrings or cufflinks. Our Handmade Paper Box base functions as a jewellery holder box that can hold and display rings, broaches and other accessories. Whether to be used as a Gift Box or Jewellery Box, it always suits for each occasion. 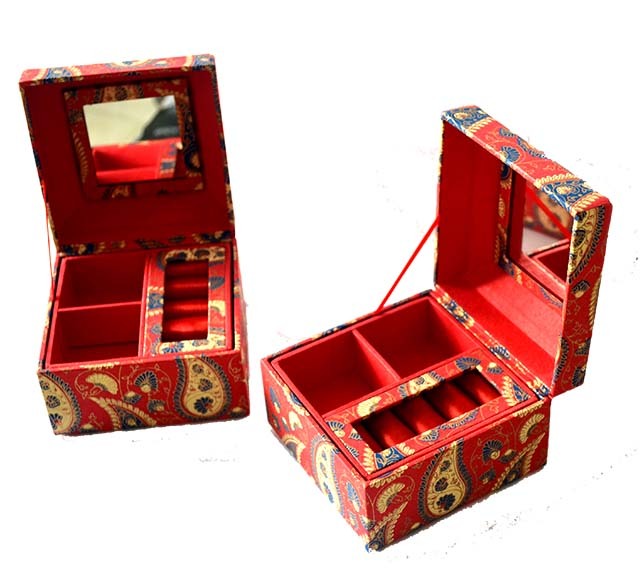 Give your favourite jewellery and accessories a safe home by ordering the handcrafted paper Jewelry Box right away! We are a global product design company providing original, modern, casual, and functional design handmade handcrafted paper boxes for the home. We at Marudhara Handmade Paper produce a variety of Paper Decoration such as Paper Snowflakes, Paper Star, Paper Buntings & Paper Hangings. We use only recycled materials to create a modern jewellery organizer box that is as beautiful as it is functional. With plated foil printing and recycled paper base, our Handcrafted Paper Box is bound to make an impact wherever you display it. All the Jewelry Boxes we produce are made from Recycled Paper and are completely Handmade. We have used Organic Ink & Dyes and we have used Hand Screen Printed Paper for this Jewelry Box. Our Decorative Paper Craft allow you to display and pack jewellery of all styles making it your ideal necklace holder, bracelet holder, jewellery box and more! Each Gift Wrap has an innovative design and unique print and pattern which can suit your need. Unlike a typical jewelry box, our gift boxes are made from durable cardboard and doubles as a dish for easy storage of rings, broaches and any other small accessories. Marudhara is committed to the high levels of quality and product excellence therefore we and our team stand behind every product we produce. We are sure you’re going to love our range of Paper bags, paper boxes, handcrafted notebooks, fancy craft paper and other related handmade cotton waste paper products. Even when our gift boxes are closed, they provide fashion-forward flair to your jewelry box. Exquisite workmanship: high-end paper structure, selected velvet lining, harmonious color match. That’s how we match our Paper Boxes.